I’m not going to try to explain what Kubernetes is. I liked Kelsey Hightower’s introductory talk at Strange Loop called “Managing Containers at Scale with CoreOS and Kubernetes”, and Kelsey has given TONS of great Kubernetes talks over the years if you want an intro. Basically Kubernetes is a distributed system that runs programs (well, containers) on computers. You tell it what to run, and it schedules it onto your machines. I drew a couple of “scenes from kubernetes” sketches today trying to explain very briefly things like “what happens when you add a new node?“. Click for a bigger version. but you should read them in detail if you want to understand how these components interact. 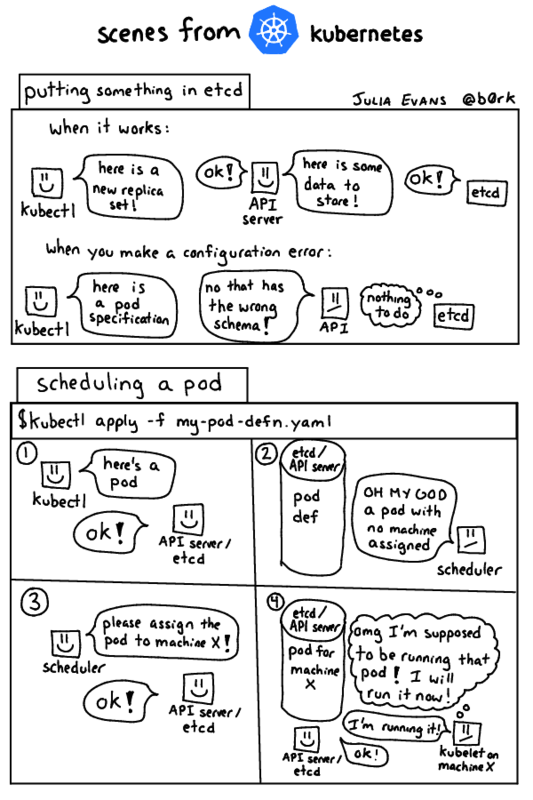 Kubernetes stuff changes pretty quickly, but I think the basic architecture like “how does the API server interact with the kubelet” hasn’t changed that much and it’s a good place to start. The next thing that really helped me understand how Kubernetes works is understanding the role of etcd a little better. Every component in Kubernetes (the API server, the scheduler, the kubelet, the controller manager, whatever) is stateless. All of the state is stored in a key-value store called etcd, and communication between components often happens via etcd. When I understood that basically everything in Kubernetes works by watching etcd for stuff it has to do, doing it, and then writing the new state back into etcd, Kubernetes made a lot more sense to me. That’s not too hard to understand! It also manages authentication (“who is allowed to put what stuff into etcd?“) which is a pretty big deal but I’m not going to go into that here. This page on Kubernetes authentication is pretty useful, though it’s kind of like “HERE ARE 9 DIFFERENT AUTHENTICATION STRATEGIES YOU COULD USE”. As far as I can tell the normal way is X509 client certs. We talked about how the scheduler takes “here’s a pod that should run somewhere” and translates that into “this pod should run on Machine X”. You can create a replica set “run 5 of these”. The “replica set controller” will, when it sees a replica set in etcd, create 5 pods that the scheduler will then schedule. The controller manager basically bundles a bunch of different programs with different jobs together. Today one of my pods wasn’t getting scheduled. I thought about it for a minute, thought “hmm, the scheduler is in charge of scheduling pods”, and went to look at the scheduler’s logs. It turned out that I’d reconfigured the scheduler wrong so it wasn’t starting anymore! The more I use k8s, the easier it is to figure out which component might be responsible when I have a problem! Once you have those 5 things, you can schedule containers to run on nodes! So if you want to run another Kubernetes component (like your overlay networking, or the DNS server, or anything else), you can just ask the API server (via kubectl apply -f your-configuration-file.yaml) to schedule it for you and it’ll run it! There’s also bootkube where you run all Kubernetes components inside Kubernetes (even the API server) but that’s not 100% production ready today. Running stuff like the DNS server inside Kubernetes seems pretty normal. this page does a pretty good job of explaining the Kubernetes networking model “every container gets an IP” but understanding how to actually make that happen is not trivial! Now I feel mostly able to set up a container networking system and like I know enough concepts to debug problems I run into! I wrote a container networking overview where I tried to summarize some of what I’ve learned. 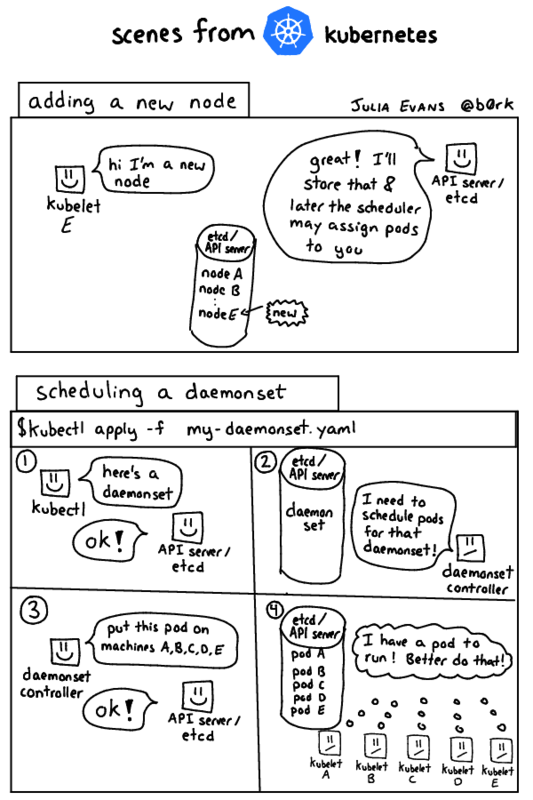 This summary of how Sophie debugged a kube-dns problem (misadventures with kube-dns) is a good example of how understanding fundamental networking concepts can help you debug problems. Here are some things that I know about now that I didn’t understand very well, say, 2 years ago. Understanding networking concepts really helps me debug issues in my Kubernetes cluster – if I had to debug networking issues in a Kubernetes cluster without understanding a lot of the networking fundamentals, I think I would just be googling error messages and trying random things to fix them and it would be miserable. The Kubernetes source code is all in Go which is great. The project moves pretty fast so stuff isn’t always documented (and you end up reading github issues sometimes to understand the current state of things), but in general I find Go code eays to read and it’s reassuring to know that I’m working with something written in a language I can understand. There’s a slack organization you can join by going to http://slack.kubernetes.io. I usually try to figure things out on my own instead of going there, but people there have been super super helpful when I have asked questions.